In 1902, Sutton and Boveri independently realized that the behavior of genes in Mendelian crosses mimics the movement of chromosomes during meiosis and fertilization. They surmised that the two alleles of each gene correlated with the homologous pair of chromosomes. 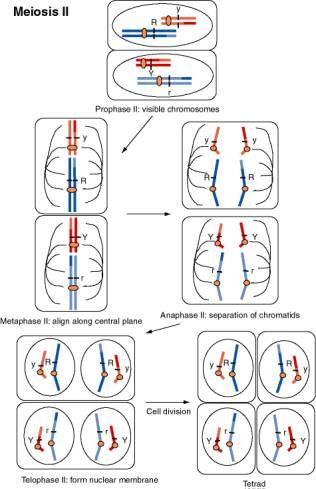 The equal segregation of alleles could be explained by the separation of homologous chromosomes at anaphase I of meiosis. As diagrammed in Fig. 1.3, the chromosome with the R allele would go to a different cell than its homolog with the r allele at the end of meiosis I, and likewise for the Yand y alleles. The rejoining of alleles corresponded to the joining of chromosomes, one from each parent, at fertilization. The independent assortment of different genes mimics the independent separation of homologs of different chromosomes in meiosis. For instance, the paternal copy of chromosome 1 may assort with the maternal copy of chromosome 21 in formation of a gamete. Figure 1.3 shows the dark blue chromosome with the R allele assorting with the light red chromosome with the yallele, but it is equally likely that it will assort with the dark red chromosome with the Yallele. As shown in Fig. 1.4, the completion of meiosis results in 4 germ cells for each cell that entered meiosis. All the combinations of alleles of different genes diagrammed in Fig. 1.2 can be formed in this process. 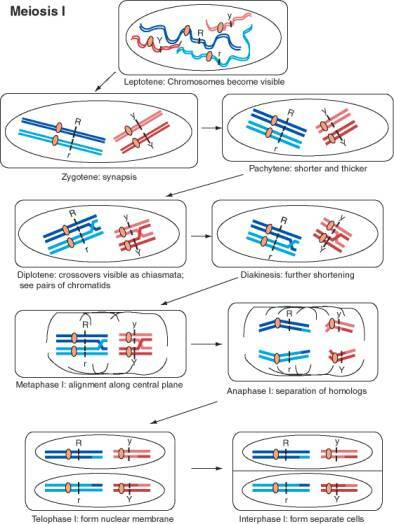 This correlation of the behavior of alleles in matings and the movement of chromosomes during meiosis and fertilization produced the chromosomal theory of inheritance. One could think of the alleles discerned in genetic crosses as being located at the same locus on the different homologs of a chromosome. Figure 1.3. Movement of chromosomes during meiosis I, the first divisional process of meiosis. The chromosomes are drawn starting after the synthesis of a copy of each homologous chromosome, so there are two copies of each homolog of a chromosome pair. The two DNA duplexes for each homolog are joined at a single centromere. Meiosis is the process of segregating these four copies of each chromosome (4 alleles for each gene) into four germ cells with one copy of each chromosome. In this diagram, two different chromosome pairs are displayed with each homolog colored a different shade (dark or light red for the shorter chromosome, dark or light blue for the longer chromosome). Each line is a duplex DNA molecule. The R locus is on the longer blue chromosome, with distinctive alleles for each homolog, and the Ylocus is on the shorter red chromosome, again with distinctive alleles for each homolog. Meiosis begins with the leptotene, when the chromosomes become visible as long filaments. The two homologous chromosomes undergo synapsis during zygotene, in which they align along their lengths. The chromosomes become shorter and thicker during pachytene, and crossovers between chromatids of the two different homologs form. The chromosomes start to pull apart in diplotene, at which point the crossovers in chiasmata are visible. The chromosomes shorten further during diakinesis. During metaphase, the chromosomes align along the equatorial plane of the cell, i.e. the plane in which cell division will occur. The nuclear membrane is disassembled at this point. The members of a homologous pair move to opposite poles of the cell during anaphase. This is the cytological even that accounts for the equal segregation of alleles. Note that the centromeres do not separate during anaphase I, and the two sister chromatids stay together. The crossovers are also resolved at this stage. In some organisms, the nuclear membrane reforms during a telophase of meiosis I, followed by cell division and an interphase I. Figure 1.4. Movement of chromosomes during meiosis II, the second divisional process of meiosis. The chromosomes, each with two sister chromatids linked at the centromere, contract and become visible during prophase II. The nuclear membrane disassembles and chromosomes align along the equatorial plane during metaphase II. The centromeres divide and the chromosomes separate during anaphase II. The nuclear membrane reforms during telophase II, and after cell division, a tetrad with one of each chromosome is produced. If the dark blue chromosome had assorted with the dark red chromosome during anaphase I, the resulting spores would be R Y and r y. The proponents of the chromosome theory of heredity realized that that the number of genes would probably greatly exceed the number of chromosomes. However, many early genetic studies showed independent assortment between genes with no evidence of linkage. This led to a proposal that a chromosome broke down during meiosis into smaller parts consisting only of individual genes, but such disassembly of chromosomes during meiosis was never observed. Evidence for linkage did eventually come from a demonstration of the absence of independent assortment between different genes. In complementary work, McClintock and Creighton demonstrated an association between different genes and a particular chromosome in 1931. The behavior of two genes carried on the same chromosome may deviate from the predictions of Mendel's 2nd law. The proportion of parental genotypes in the F2 may be greater than expected because of a reduction in nonparental genotypes. This propensity of some characters to remain associated instead of assorting independently is called linkage. When deduced from studies of a population, it is called linkage disequilibrium. Fig. 1.5. illustrates a cross that shows linkage. 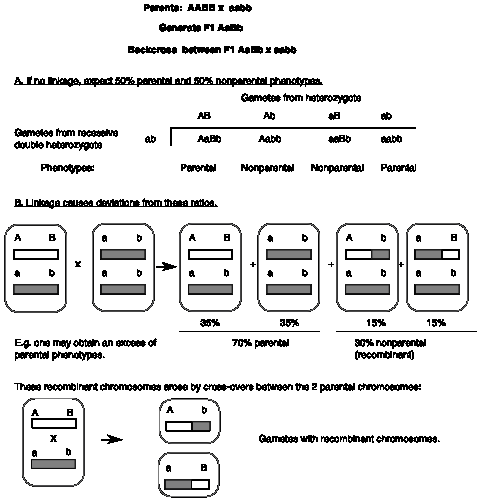 Figure 1.5.Linkage and recombination between genes on the same chromosome. If the two genes are linked and there is no recombination between them, then all progeny will have a parental phenotype. In particular, if genes A and B are linked, then the backcross AB/ab x ab/ab yields AB/ab progeny 50% of the time and ab/ab progeny 50% of the time, in the absence of recombination. [In this notation, the alleles to the left of the slash (/) are linked on one chromosome and the alleles to the right of the slash are linked on the homologous chromosome.] Thus only the parental phenotypes are found in the progeny of this cross (i.e. the progeny will show either the dominant characters at each locus or the recessive characters at each locus). Another way of looking at this is that, in the absence of recombination between the homologous chromosomes, all the progeny of this cross will be one of the first two types shown in panel B of Fig. 1.5. Note that the dominant alleles can be in the opposite phase, with the dominant Aallele linked to the recessive b allele. For instance, the F1 heterozygote could be formed by a cross between the parents Ab/Aband aB/aBto generate Ab/aB. In this case, the backcross Ab/aBx ab/ab will still generate only progeny with parental phenotypes but a new, nonparental genotype (i.e. Ab/aband aB/ab; these look like the parents Ab/Ab and aB/aB). The phase with both dominant alleles on the same chromosome is called the "coupling conformation”, whereas the opposite phase is called the "repulsing conformation." But in most cases, recombination can occur between linked genes. In part B of Fig. 1.5, there is an increase in parental types (from the 50% expected for unlinked genes to the observed 70%) and a decreasein nonparental types (30%), showing that allele Atends to stay with allele B, in contrast to the prediction of the 2nd law. Thus these genes are not assorting independently, and one concludes there is linkage between genes Aand B. The frequency of parental types is not as high as expected for linkage without recombination (which would have been 100%, as discussed above). Indeed, the nonparental types in this experiment result from a physical crossover (breaking and rejoining) between the two homologous chromosomes during meiosis in the AB/ab parent. This is a recombination event in the DNA. (5) We conclude that genes A and Bare linked, and have a recombination frequency of 30%. In their genetic studies of the fruitfly Drosophila melanogaster, Thomas Hunt Morgan and his co-workers found many examples of genes that associated together in groups. One example is the gene for purple eye color (the mutant allele is abbreviated pr) that is recessive to the allele for normal red eyes (pr+) and the gene for vestigial, or shortened, wings (the mutant allele is abbreviated vg) that is recessive to the normal allele for long wings (vg+). When a homozygous purple vestigialfly is crossed to a homozygous red-eyed long-winged fly, the heterozygous F1 generation shows a normal phenotype. When male heterozygotes are backcrossed to females that are homozygous purple vestigial (i.e. homozygous recessive at both loci), only two phenotypes appear in the progeny: the homozygous recessive purple vestigialflies and the normal flies. What are the predictions of the backcross if the two genes are not linked? What do the results of the backcross tell you? If the heterozygotes F1 in the backcross are female, then purple long-winged and red-eyed vestigialflies appear in the progeny. The combined frequency of these recombinant types is 15.2 %. What does this tell you about the arrangement of the genes? Question 1.5 provides some practice in calculating recombination frequencies. The recombination distances are not strictly additive if multiple crossovers can occur (see questions 1.6 and 1.7.) Recombination between linked genes occurs by the process of crossing over between chromosomes, at chiasma during meiosis. The mechanism of recombination is considered in Chapter 8.